Mòr-reic // Wholesale – Ò! Nam biodh tu airson nan cairtean agam a rèic sa bhùth agadsa, bhithinn gu math toilichte sin a chur air dòigh. Nach cuir thu post-d thugam air rhona@o-alba.com. Gheibh thu clàr-reic gu h-ìosal. Ma tha thu a’ sireadh rudeigin sònraichte, bithinn gu math toilichte a bhruidhinn air seo, cuideachd. Tha fiughair agam ri cluinntinn bhuat. 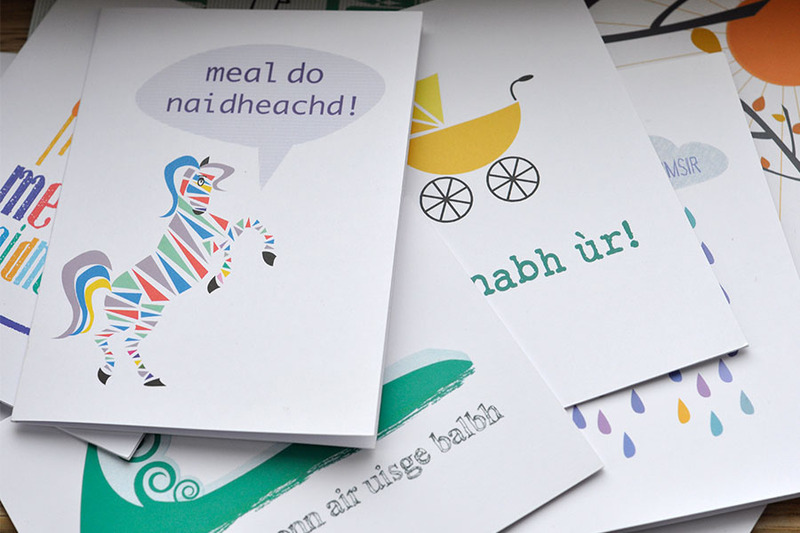 If you would be interested in selling any of my cards in your shop, I’d be delighted to have a chat and arrange that with you. Please feel free to drop me an e-mail at rhona@o-alba.com. You can also download a line sheet by clicking below. If you’re looking for something in particular, I’d be more than happy to discuss that as well and see what I can do.